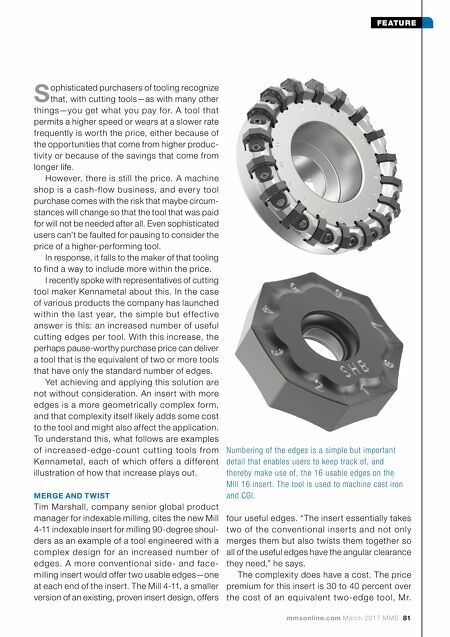 mmsonline.com March 2017 MMS 81 FEATURE S ophisticated purchasers of tooling recognize that, with cutting tools—as with many other things—you get what you pay for. A tool that permits a higher speed or wears at a slower rate frequently is worth the price, either because of the opportunities that come from higher produc- tivity or because of the savings that come from longer life. However, there is still the price. A machine shop is a cash-flow business, and ever y tool purchase comes with the risk that maybe circum- stances will change so that the tool that was paid for will not be needed after all. Even sophisticated users can't be faulted for pausing to consider the price of a higher-performing tool. In response, it falls to the maker of that tooling to find a way to include more within the price. I recently spoke with representatives of cutting tool maker Kennametal about this. In the case of various products the company has launched within the last ye ar, the simple but ef fe ctive answer is this: an increased number of useful cutting edges per tool. With this increase, the perhaps pause-worthy purchase price can deliver a tool that is the equivalent of two or more tools that have only the standard number of edges. Yet achieving and applying this solution are not without consideration. An insert with more edges is a more geometrically complex form, and that complexity itself likely adds some cost to the tool and might also affect the application. To understand this, what follows are examples of inc re a se d- e d g e - c ou nt cu t ting to o ls f ro m Kennametal, each of which of fers a dif ferent illustration of how that increase plays out. MERGE AND TWIST Tim Marshall, company senior global product manager for indexable milling, cites the new Mill 4-11 indexable insert for milling 90-degree shoul- ders as an example of a tool engineered with a complex de sign for a n incre ase d numbe r of edges. A more conventional side- and face- milling insert would offer two usable edges—one at each end of the insert. The Mill 4-11, a smaller version of an existing, proven insert design, offers Numbering of the edges is a simple but important detail that enables users to keep track of, and thereby make use of, the 16 usable edges on the Mill 16 insert. The tool is used to machine cast iron and CGI. four useful edges. "The insert essentially takes t wo of the conventional inser ts and not only merges them but also twists them together so all of the useful edges have the angular clearance they need," he says. The complexity does have a cost. 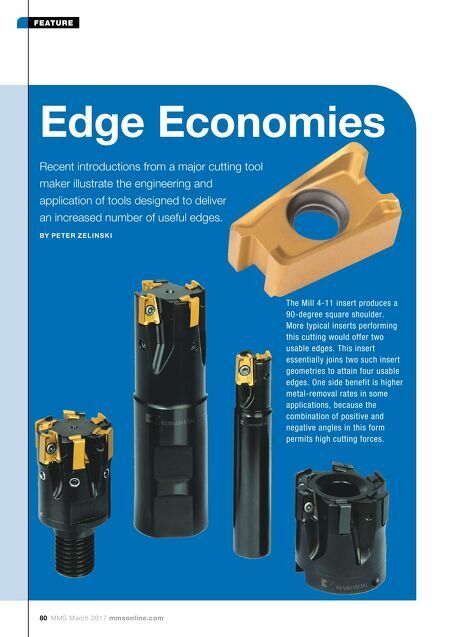 The price premium for this insert is 30 to 40 percent over the cost of an equivalent t wo-edge tool, Mr.